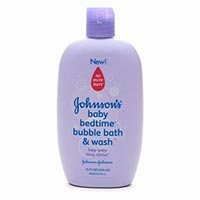 Johnsons Bedtime bubble bath & wash combines Natural calm essences with lots of bubbles and our No More Tears Formula, extra gentle baby wash. Use it with Johnson's 3-step nightly routine to help your baby sleep better. Treat your baby to a warm Bubble Bath Johnson's Bedtime bubble bath & Wash, then gently massage skin with Johnson's Bedtime Lotion. It's helps my LOs relax after a busy day.